An epic battle. Ken on his 500 Manx holds off Tom Phillis' works 250-4 Honda at Hume Weir. Every sport and every era has its champions. They rise to fame, dominate their particular field for a while, and then disappear. Our sport is so specialised and demanding that it is unusual for anyone to excel in more than one branch at a time. There are exceptions, of course. Desert and enduro expert Graham Smith, for example, also starred in trials, moto cross and road racing. Many times Australian Sidecar Road Racing Champion Geoff Taylor was also a former solo motocross champion. 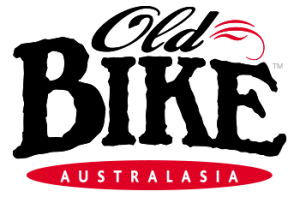 West Australian Peter Nicol was a champion road racer as well as Australian Scrambles Champion on several occasions. But in the post-WW2 era, one name stands out as the most versatile champion of them all; a man with such natural skill and determination that he won countless Australian titles in motocross, short circuit, grass track, solo road racing and sidecar road racing – Ken Rumble. I remember Ken when he was just a teenage kid with a cheeky grin. He was a member of Victoria’s East Malvern Motorcycle Club, and he would come along to meetings with his brother Gordon, and Jack Martin in their 1920 Yellow Cab. They were all about on par in those days as far as riding ability went, but Ken had the determination not only to win races, but to become a champion. His greatest fan and mentor was the club president, the late Jack Craig. Ken rode a flat-tank big-port AJS at first, but soon changed to a BSA B31, about a 1947 model, with telescopic forks and a rigid frame. I remember his first big success, the 1949 Victorian Scrambles Championships at Jordanville. Ken was just a battler with a fairly slow bike, and not to be reckoned with among the greats of the day, like Geoff Blythe on his fabulous old AJS, Duncan Smith on his Velocette, Ron Jones on his AJS Rudge Special, Ron and Murray Hunter (the Flying Flea and the Fleeing Fly), and Harold Tapscott, who had just returned from England with a very quick BSA. Ken surprised everyone by turning up with a new 350cc Speedway JAP motor fitted to his BSA, but the motor was leaning backwards in the frame. They had set up the motor in the frame on the kitchen table with the bike on its rear stand, but had forgotten to allow for the fact that the back wheel was 15cm off the table! Lean or no lean, the BSA/JAP went well enough for Ken to win the 350 title, and finish second in the 500 class to Tapscott. Ken won the crowd with his forceful riding – not much style or polish, but lots of heart. Ken Rumble had arrived. The unbeatable combination. Ken with the scrambles version of the Walsh Bantam. 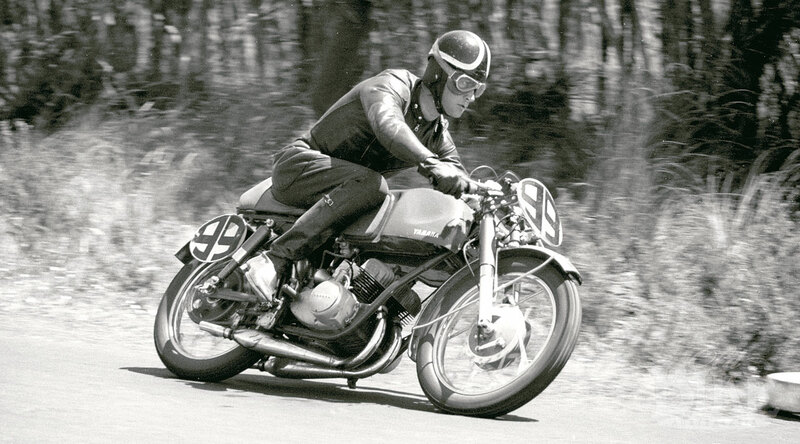 I remember Ken winning all the solo classes (except the 350, won narrowly by John Burrows) of the inaugural Australian Scramble Championships at Korweinguboora in 1953, on the Walsh Bantam and his own G80 Matchless. It was a terribly muddy meeting but Ken had the answer to mud; plenty of throttle and a 23-inch speedway front wheel. The mud forced Ken to discard his goggles and at the finish he had so much mud in his eyes he had to be led to the ambulance tent to have his eyes washed out before he could be presented with his awards. He couldn’t see to find the tent, but he knew the track blindfolded. Many good riders on good five-hundreds found the combination hard to beat, wet or dry, hilly or flat. They were ahead of their time, as later motocross developments proved. Ken’s greatest adversary in the early ‘fifties was George Bailey on his 500cc Matchless. It would be hard to imagine two more different riders than Ken and George. George was a heady rider, very fast but safe and polished, never using a centimetre more track than necessary. Ken was plain hairy, but with fantastic reflexes and an uncanny ability to save the day by instinctively doing the right thing at the right time. I remember them having terrific battles at Langwarrin, George’s home track – George on the 500 taking the inside line, braking hard into the corners, then accelerating hard in a straight line to the next corner. Ken on the Bantam was more off the track than on it, his speed through the corners twice as fast as George’s, but he covered twice as much ground, so there was never much between them at the finish. The crowd loved it! I remember when Les Sheehan came back from England after a couple of seasons as an AJS factory rider. Les taught the Australians how to jump. Ken was never a good jumper – his speciality was fast cornering, rough or smooth. At a meeting at Point Henry, near Geelong, Ken (on his Gold Star BSA) turned the tables on the AJS star by outriding him through the fast, rough corners. Later, Ray Fisher and Ken, both on Gold Stars, had a terrific battle for the Victorian Grand National at Craigieburn. Ray had been Ken’s protégé and was getting better all the time. It was muddy again and the first few laps were close but Ray gradually pulled away and had a half-lap lead by lap 15. But Ken had been saving himself and suddenly decided it was time to go if he wanted to win, and rode the last five laps ferociously. Ray saw what was happening and tried to match Ken’s pace. With a lap to go, only the length of the straight separated them with Ken still gaining fast, but an exhausted Fisher managed to hold on just long enough to win by two lengths, with John Burrows third, a lap behind. It was Ken’s last great motocross race. I remember Ken’s first road race, at Fishermen’s Bend, on his touring Triumph Tiger 100 some years earlier. It wasn’t a very illustrious start. He was the most untidy rider, with a foot down at every corner, trying to coax the Triumph to slide. His first real road racing successes came at Darley in the early ‘fifties on a Bantam which he owned and Bert Flood tuned – and which Ken later sold to me, but it went much faster with him on it. 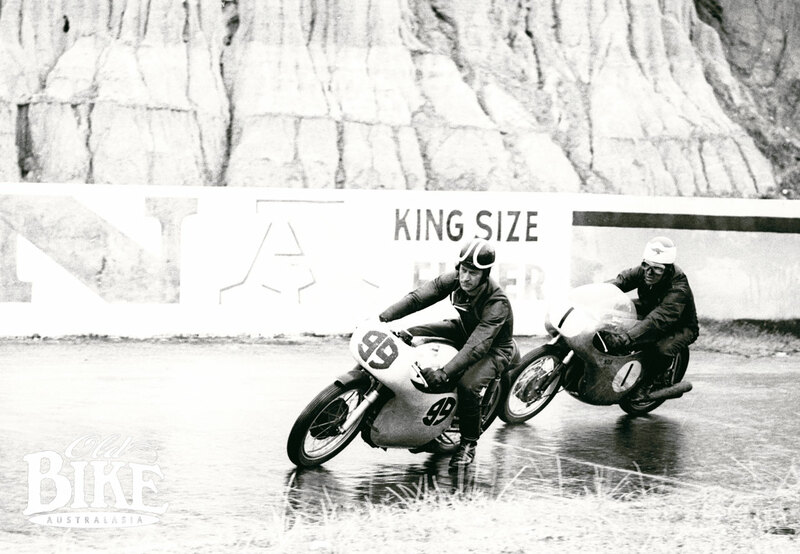 Bert and Ken had terrific battles at Darley, using far more than the narrow strip of bitumen at Chimney Corner lap after lap, where it was flat out in top gear, on the dirt. Ken Rumble: 500 Manx mounted at Bandiana in 1956. When Maurie Quincey went overseas in 1954, Eric Walsh put Ken on the road-racing Walsh Bantam as well as the scrambles one. It was the same motor, anyway. 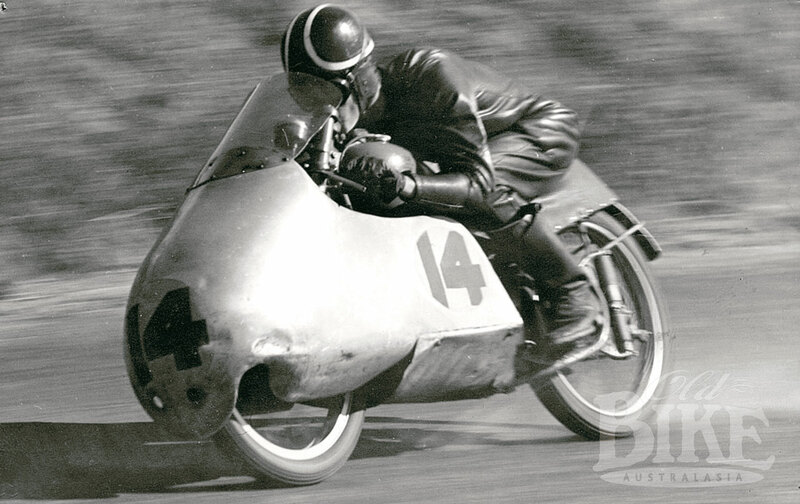 Ken beat all comers in the 125cc class (including three Bathurst victories, 1954, 1956 and 1957), although clubmate Eric Miller beat him at Fishermen’s Bend once. 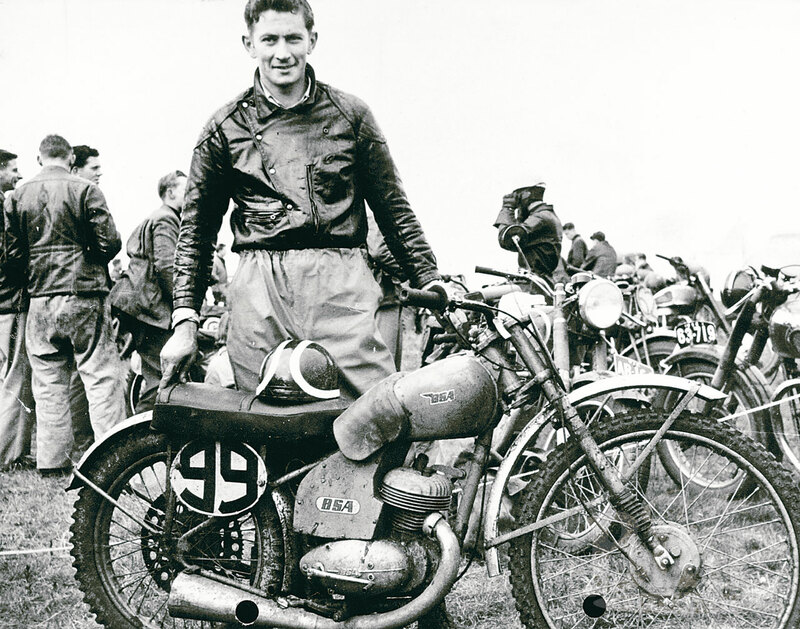 After Quincey returned, Eric Walsh prepared a Bantam for each of them for the Victorian TT at Victoria Park, Ballarat. Ken, as usual, was determined to win, but his motor developed a miss in practice and was miles slower than Maurice’s. Ken tried to make up for it by using his Darley tactics on the narrow tree-lined circuit. He was brushing the straw bales through Pit Corner, a good two metres off the bitumen cornering faster than anyone else, but still Maurice, champion that he was, remained that tantalising few lengths in front. Ken threw everything he knew into a fantastic last lap, getting within yards of Maurice at Pit Corner, but when the chequered flag came out, there was Maurice but no Ken. A few seconds later he rode in, his face covered in blood after crashing at Cannon Corner. Heading for another Bathurst win on the Walsh Bantam in 1957. I remember one particular hard and dusty scramble at Footscray. Ken turned up on the Walsh Bantam to battle it out with the big four strokes in the Unlimited Race. With its ultra-peaky motor and high first gear (only a three-speed box, remember), Ken was well back on the first lap, but making up ground fast. Around a fast right-hander at the back of the circuit, the screaming Bantam over-slid and Ken and the bike disappeared behind a row of straw bales in a cloud of dust, with the Bantam on its side. But still the screaming exhaust note and dust continued and from the other side of the bales emerged Ken, still with a fistful of revs, fighting to get the Bantam back under control. He won the fight and the race. It was the best ‘save’ I’ve seen in 30 years of racing, and was all captured on film by Stan Ebery; a lasting testimony to Ken’s never-say-die attitude. Left: Charles Rice’s fine portrait of Ken Rumble taken at Mount Druitt, 1958. Right: Ken (left) with the Hinton family, Harry Junior, Eric and Harry Senior, at Victoria Park, Ballarat. I remember another great last-lap effort by Ken at Mildura when he beat Don Cameron on the last corner by riding around the outside of him, both on Walsh Bantams. He was placed in 250 races on the Bantam quite often. Ken tidied up his style to become one of the greats of Australian road racing on Manx Nortons. He won the 250cc TT at Bathurst in 1958 on the Diener Velocette and the 500cc TT in 1962. This was one race that Ken didn’t deserve to win. Trevor Pound had it in the bag, including the lap record, but ran out of fuel on the last lap. But the following Easter it was Ken’s turn for misfortune when his rear brake rod snapped at Murray’s Corner while leading and just scraped into the escape road leading to Bathurst. Kel Carruthers went on to score his first ‘Senior’ victory. Ken Rumble aboard the troublesome Yamaha YDS1-R at Phillip Island, 1962. Earlier, Ken had decided to forsake a secure job and local stardom for an attack on the European scene. He was to travel overseas with his good friend Ron Miles, who had made a big impression in his first season on the Continent. But when Miles was killed in the 1961 Ulster Grand Prix, Ken abandoned his plans. One of Ken’s most memorable rides on the Manx was at Hume Weir in about 1961. Tom Phillis was by this time a fully-fledged works rider for Honda, and a potential world champion, which he later turned into reality in the 125cc class. For his return to Australia, the Honda factory loaned Tom a works 250-4, which were virtually unbeatable at the time. Ken would not have seen which way the Honda went in the dry, but the skies opened up for this particular 500cc Senior race, giving Ken just the chance he needed. Right from the start, it was just Ken and Tom, hammer and tongs in the pouring rain on the narrow slippery track. Neither would give an inch as they passed and repassed throughout the race, the high-pitched wail of the Honda modulating with wheelspin as it accelerated out of the corners, contrasting with the steady beat of the Manx as Ken drew on all his muddy motocross experience to find traction and keep the Manx upright under brakes. Right to the last lap they battled it out, with never more than a length or two separating them. Through the esses for the final time, Ken was just ahead, cornering just that fraction faster than Tom and holding off the faster accelerating Honda to the finish line. The crowd gave them both a tremendous ovation. Around this time, Yamaha distributors Milledge Brothers gave Ken one of the very first Yamaha production racers, a YDS1-R. 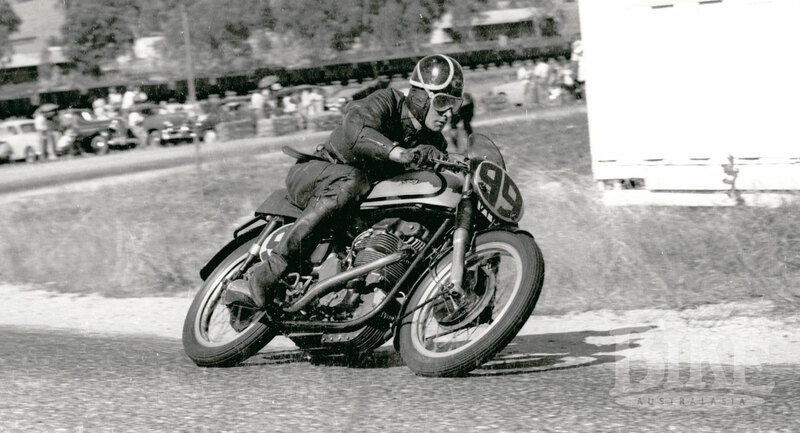 The ugly, seizure-prone, bronze coloured Yamaha proved difficult on the tar, but Ken, typically undaunted, fitted wide handlebars and attacked the Australian Short Circuit Championships at Campbellfield, winning four races in one day. His 250cc title win was Yamaha’s first Australian championship victory. I remember Ken arriving at an Australian Short Circuit Championship with a Featherbed Manx Norton fitted with a 23-inch speedway front wheel, and motocross handlebars and rear tyre, and beating Herb Jefferson and Ray Owen on their sliders. He took the same bike to a Victorian Grass Track Championships at Keyneton and once again trounced the slider-framed specials ridden by the top mile-track riders of the day. The last stage of an illustrious career. Ken and Alan Jemison on the Doyle Triumph at Calder. There was virtually nothing that Ken couldn’t do, and do well on a bike…with the exception of trials, as he liked to have the throttle wide open as much as possible. I remember one scramble at Fishermen’s Bend when George Murphy, the sidecar champion, had an attack of asthma and couldn’t ride his Ariel outfit. Ken expressed an interest, so George sent him out in practice with a few pointers on sidecar racing. Came the event and – you’ve guessed it – Ken came home a winner once more. 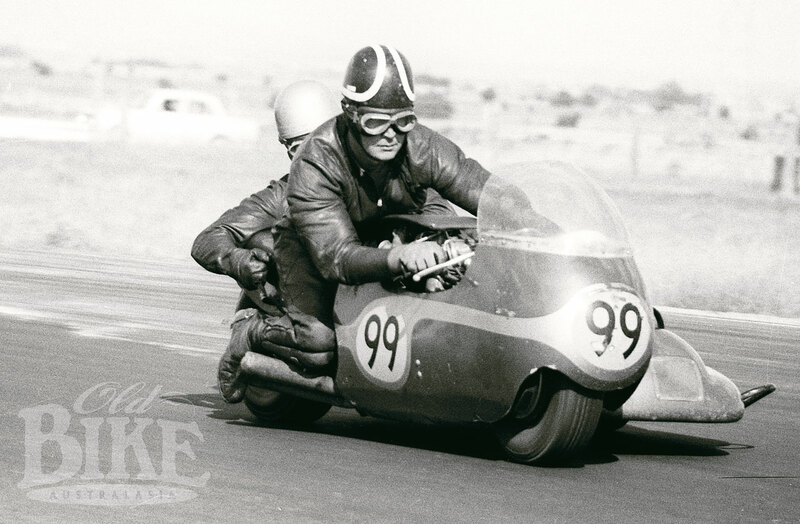 It was his first sidecar race, but he went on to win an Australian Junior Sidecar Grand Prix at Mallala, South Australia in 1970, riding his Doyle Triumph with Alan Jemison as passenger. It was in sidecar racing that Ken sustained the only serious injury of his career, a badly broken leg that continued to give him trouble up to the time of his death, at just 58, in September 1986. Throughout his career, Ken’s helmet was always adorned with the black and white colours of his trade, as a butcher in Gippsland. Ken Rumble never made a lot of money out of motorcycling, but he made thousands of friends and admirers. Including me. 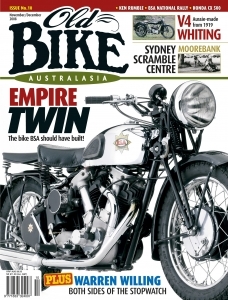 This article first appeared in Old Bike Australasia Issue No.10.